Papers relating to the abdication of Edward VIII have been released for the first time - but with one set held back amid speculation that they may cause embarrassment to the Queen Mother. Historians have expressed dismay that the "crown jewels" of the archive of the former King's lawyer and close friend Sir Walter Monckton would not now be released until 2037. Oxford's Bodleian Library released 10 boxes of the Monckton papers on Wednesday, but held back material in a file labelled "Box 24". Academics have speculated that the box may contain files relating to the Queen Mother's role in the abdication crisis of 1936. Historians believe the missing letter could have shed more light on the extent of the feud between Buckingham Palace and the Duke of Windsor, formerly Edward VIII, and his wife, twice-divorced American Wallis Simpson. Oxford University denied it was responsible for taking the letter out and it was unclear who had removed the document or when. The archive is understood to contain unofficial correspondence between the Queen Mother and Sir Walter, who advised Edward VIII on his abdication after only a few months as monarch. 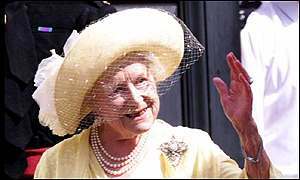 BBC Diplomatic Correspondent Nicholas Witchell said the Queen Mother was known to have been severely critical of Wallis Simpson, the American divorcee whose relationship with Edward VIII led to his abdicating the throne. "The lowest of the low"
Historian and expert on the abdication Andrew Roberts said: "I don't know what is in the box because I have not seen the documents but it appears the crown jewels are missing from this collection." Mr Roberts said one of missing letters from the then Queen to Sir Walter in August 1940 may have been related to the arrival of Edward and Mrs Simpson in the Bahamas, where the former King was to become governor. It was sent just days after Queen Elizabeth had written to the Colonial Secretary Lord Lloyd expressing unhappiness that the Duke of Windsor was being made Governor of the Bahamas. In that letter, she describes the Duchess of Windsor as a bad example for England and the "the lowest of the low". Mr Roberts said that the missing letter may well have been more vitriolic in tone as it was written to a confidante. "This letter could be terribly exciting and a real insight into the extent of the personal feud between the then Queen and the Windsors," he said. Oxford University professor of politics and government Vernon Bogdanor said the papers available did not contain any spectacular revelations but filled in vital historical gaps. Prof Bogdanor said of the archive: "This is part of history and part of British constitution, but also a personal family matter and a personal family wound and I don't believe the Royal Family want that wound constantly exposed." Among the documents was a letter sent to Sir Walter by Buckingham Palace in January 1949. It said that a signed statement from Wallis Simpson had been found among papers belonging to the Prime Minister, Stanley Baldwin. It was written in the months leading up to the abdication and said: "With deepest personal sorrow, Mrs Simpson wishes to announce that she is abandoning any intentions of marrying his Majesty." The statement was never made public. Edward abdicated in December 1936, and married Wallis six months later. Also among the papers was a 1939 telegram from the Duke of Windsor - as Edward VIII became known - to Adolf Hitler. The Duke is believed to have been sympathetic to the Nazis. But Prof Bogdanor said there was "no evidence whatsoever" that the Duke had been involved in treason. He said: "There is a telegram to Hitler just before the war urging a peaceful solution and there is a reply from Hitler saying peace depends on England and not Germany." Sir Walter Monckton was Edward VIII's closest adviser at the time he took the decision to give up the throne and marry Mrs Simpson. He drafted the legal document formalising the abdication, which stunned the nation and caused a divide within the Royal Family. After the abdication, he acted as go-between in the increasingly acrimonious relationship between the Duke of Windsor and his brother George VI. "One complete file is missing and may not be released until 2037"
"Why they have to be held back for 37 years?"